Hygienically clean flow metering instrumentation for measuring motion of a substance for food, drink and pharmaceutical processes. Hygienic measurement instrumentation are designed for use by the food, drink and pharmaceutical industries, which require a high level of cleanliness in their manufacturing processes. To maintain hygiene in production processes, equipment needs to be designed so that it is possible to easily clean all parts in contact with the process media. Also the contact surface of these parts should deter the build up of bacteria and mould and other pathogens that may cause harm to human health. Hygienic instruments have highly polished stainless steel parts exposed to the process media and are installed using clamped seals. Direct threaded type fittings are avoided since they introduce crevices which would attract the build up of process material over time and require dismantling for cleaning. Threads are used in some types of clamped fittings in order to pull two components together to make a seal, but are only used on the non-contacting external surfaces. A flow meter is category of device that is assigned to any instrument which can measure either directly or indirectly the quantity of a substance passing through a specific location. A flow meter will typically measure the speed of flow as the primary reading, and some depending on the technology may include additional secondary readings to compensate for variations in flow due to pressure, temperature, density and viscosity changes. 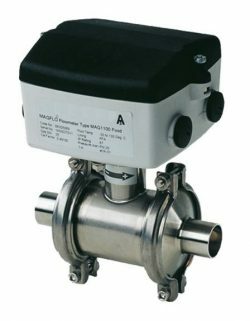 Some flowmeters include additional instrumentation to manipulate the flow reading to provide other functions such as the total quantity indication, or alarms each time a batch has been completed. Send us your enquiry for Hygienic Flow Meters to get assistance with this product type.